Lisa Norris’s story collection, Women Who Sleep With Animals, won the Stephen F. Austin University Press Prize for fiction and was published in 2011. (Order here or on amazon.com.) It was also a finalist for the Spokane Prize. Her first book, Toy Guns: Stories, won the Willa Cather Fiction Prize in 1999 and was published by Helicon Nine Press (order TOY GUNS here or on amazon.com). Her stories, poems and creative nonfiction have been published in Fourth Genre, Ascent, Terrain.Org, South Dakota Review, Smartish Pace, Notre Dame Review, an anthology called Kiss Tomorrow Hello (Doubleday 2006) and others. Click on LINKS above to read some of her work. Lisa Norris grew up as part of a Navy family, moving between four states and the Philippines. After she earned a forestry degree from Virginia Tech and worked as a fire dispatcher, trail ranger and biological technician, she moved to Idaho and earned an M.A. in English from Idaho State University. She taught English and creative writing in Idaho and Oregon for ten years, then moved to Washington, D.C., where she completed her M.F.A. in Creative Writing from American University. Except for a year as an assistant professor at Minnesota State University in Mankato, she taught at Virginia Tech from 1991-2007, spending summer weeks in the Pacific Northwest, where she met annually with the Free Range Writers, featured in Poets and Writers May/June 2005 (“From the Garden to the Forest”). In 2007, she returned to the Pacific Northwest to teach writing and literature at Central Washington University in Ellensburg. 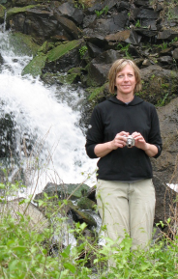 Her son Will Stauffer-Norris is an environmental activist and filmmaker. His work is featured at http://www.willstauffernorris.com. Photo Credits: The landscape photo above is by Greg Jahn (http://www.gregjahnphoto.com). The author photo is by Robert Rittenhouse.